Your Reliable Resource For Appliance Repair! : Call (414) 892-7603 Now! Save time and money on your appliance repairs with fast and friendly service from Alliance Appliance. Offering some of the lowest prices in the Milwaukee area, we’re your hometown specialist for refrigerator repair, oven repair, dryer repair, and more. Even on nights and weekends, you pay the same low rates for appliance repair. That’s what friends are for! Kitchen and laundry appliances are indispensable to your everyday routine, but that’s no reason to rush right out and choose appliance replacement over appliance repair. Not only will you save hundreds by opting for the appliance repair service of Alliance Appliance, but you’ll also avoid the added hassle of having to run from store to store looking for the best price on the unit you want and then waiting for it to be delivered and installed. With our low prices and quick turnaround times, you have a true ally in the appliance repair industry. 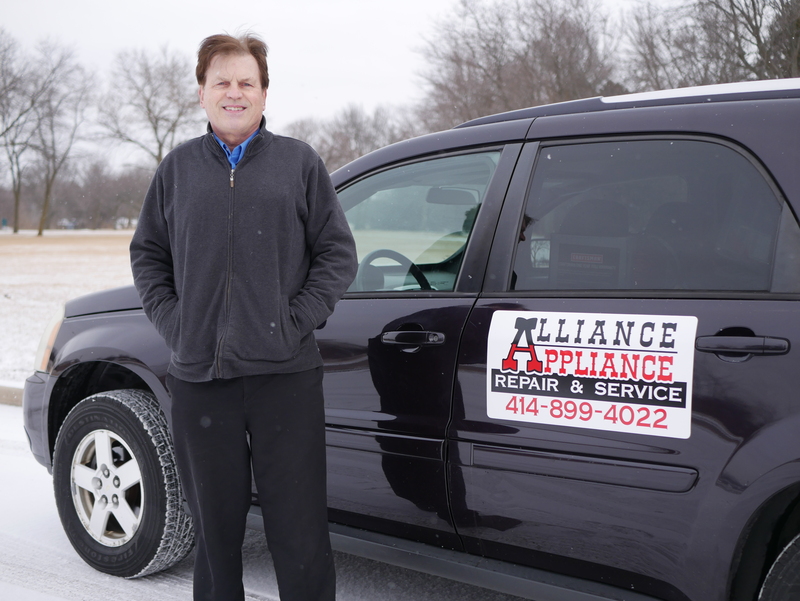 Since 2008, Alliance Appliance has been a reliable resource for Milwaukee-area property owners seeking the assistance of an appliance repair professional. Whether you’re on the lookout for residential refrigerator repair, dryer repair, or dishwasher repair, or you need service for a commercial oven repair, don’t hesitate to contact our locally owned and operated appliance repair business. From our centralized location, we provide efficient and affordable service for communities throughout Milwaukee and beyond, including Franklin, Fox Point, Germantown, New Berlin, and Whitefish Bay. Mention this ad and receive 20% off of Appliance Blue Book pricing. At Alliance Appliance, we understand the need for speed when it comes to appliance repair. That’s why we’re available 7 days a week for a timely response to your major appliance repairs, including refrigerator repair, washing machine repair, oven repair, and more. We work on all makes and models of equipment from Bosch to General Electric to Whirlpool, and we never charge extra for late night or weekend hours. Our reasonable rates are good around the clock. We also stand behind your residential or commercial service with six-month warranties on all of our professional appliance repairs. So when technical difficulties leave you scrambling for answers, don’t run out and drop a bundle on a whole new piece of equipment. Instead, go with the appliance repair specialist that’s friendly on your budget and your schedule. Alliance Appliance is fully insured for your complete peace of mind, and we’re available at your convenience for a wide range of appliance repairs. Contact us now by phone or email! Need immediate assistance with an appliance repair? You’ve come to the right place! Alliance Appliance can provide emergency service for your home refrigerator repair, commercial oven repair, and more. Just give us a call any time of the day or night. We’re always here to help! It’s good to have a friend in the appliance repair business, and no one in the Milwaukee metro will be easier on your schedule or kinder to your wallet than Alliance Appliance. Specializing in fast and affordable service for residential appliance repairs as well as commercial oven repair, we’re the company to call when your household or restaurant could use a skillful helping hand. From refrigerator repair for your GE model to oven repair for your eatery, we have your appliance repairs covered across all types of brands and breakdowns. To set up swift and cost-effective appliance repair service, reach us today over the phone or online!